Warning: the following was written while in the throws of flu-induced fever. I cannot be entirely responsible for the content. I’m sick. I’ve got all the classic symptoms. I haven’t knitted or written at all today. I watched Regis and Kelly, Rachael Ray, and The View before taking a nap. When I woke up I watched CNN until 4 pm (it was an eternity), at which point I switched over to Oprah. Followed by the 5 pm news, the 6 pm news, the 630 “world” news and then the Election Eve News Special. Now I’m watching the Chinese restaurant episode of Seinfeld and Mr. Interrupted is trying to wrangle the children by bribing them with Taco Bell food. To top it off, 3000+ words into my novel, I think I need to start over. I’m already bored with it. I mean, two of my main characters are eating cereal and talking about the National Enquirer, for crissakes! Although, I probably won’t change the plot, just the starting point and the voice (from 3rd person to 1st). How long does the flu last? I have a knitting basket with a lot of other stuff in it. 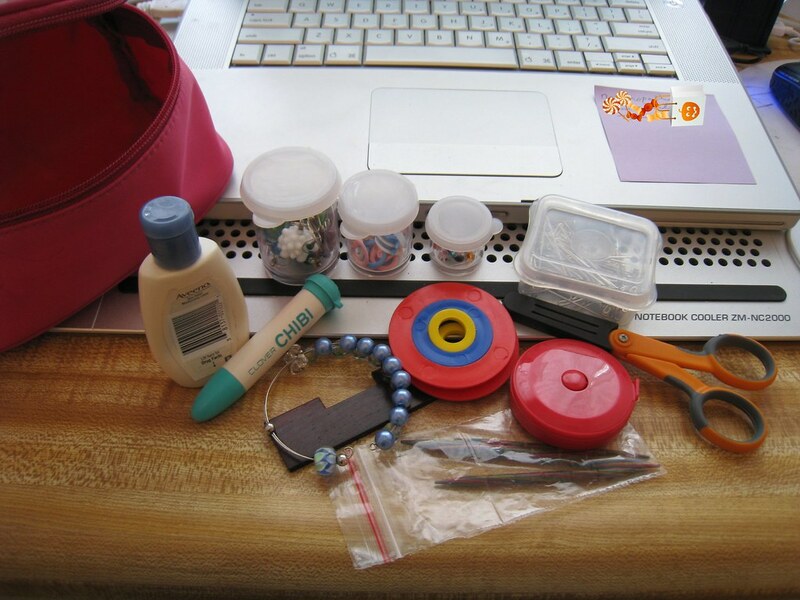 This is my “traveling” kit–the junk I bring with me when I go knitting out and about. T-pins. Honestly, I’m not sure why those are in there, but they are. WPI thingamabob. Again, not sure why it’s in there except that it’s pretty and makes me happy.